I’m working on a manuscript describing the different and particular challenges scientists in various disciplines face when incorporating citizen science into their research. 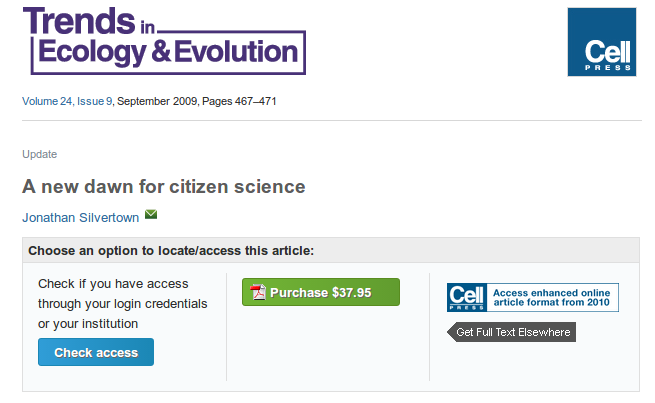 So, I thought I would go looking for other articles about it, and found one with the promising title A new dawn for citizen science by Jonathan Silvertown. Huh. $37.95. Let it not escape your notice that Dr. Silvertown, who I don’t know and is probably a nice fellow, teaches at the Open University. tl;dr : Let’s not involve the public in our discussions about their utility in our research.